TLC acknowledges that it is the responsibility of parents, schools, and the community as a whole to assure that their deaf children have a first language. 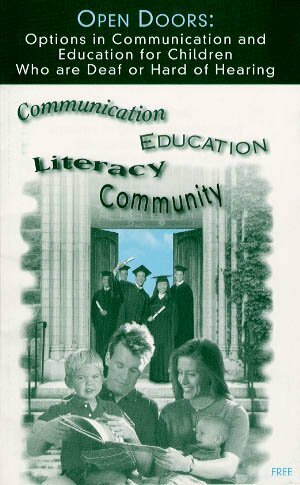 To this end TLC supports and encourages parent and teachers of Deaf Children to learn effective visual means of communication in order to give our children a greater opportunity for a brighter future. Click on the above image to get to the booklet. Currently we are in the process of Planning the Cue Camp and hope to be able to host a Cue Camp by late Summer 2001. Keep checking back for Cue Camp Updates here at this page. Broadband entertainment-on-demand company MovieFlix has teamed with the U.S. Department of Education’s Captioned Media Program to deliver online movies for the deaf and hard of hearing. MovieFlix created a "captioned" genre at its site and will launch the area with more than a dozen films and TV programs, such as "McLin-tock!" starring John Wayne, and "The Jack Benny Show." For families with newly diagnosed children, if you would like to have someone come to your home to teach Cueing, to sign up please click here.